Green Dragon Organic Farm and B&B is a unique small-scale farm, just outside of Tatamagouche, on the North Shore of Nova Scotia. We combine traditional animal husbandry and an old-fashioned market garden which includes four passive solar greenhouses. In our garden we emphasize handwork, specializing in over wintering hardy greens in order to have fresh produce available from March to December. Our intent is to be both self-sustaining and commercial, and to practice global stewardship. 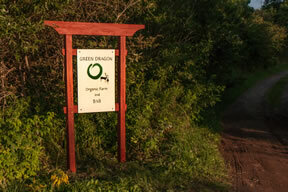 We have been Certified Organic for a few years and became Certified Biodynamic in 2009. The Biodynamic Farming Method, introduced by Rudolf Steiner in 1924, provides a holistic way to reform and shift values and methods towards a more sustainable and healthier future. The Farm Getaway - Open Year Round! Stay with us for the night at the low rate of $89. Our comfortable, environmentally-friendly B & B features a guest room renovated with all natural materials, a queen-sized bed, a private entrance with either a shared or private 4 piece bath. 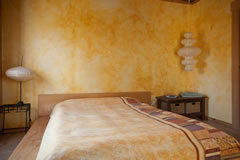 You will be comforted to know that our guest room is a non-smoking facility and pet-free. Read more: The Farm Getaway - Open Year Round! We began our inspection at the early hour of 7am. , Monday August 18, as Stephan wanted to get away later that morning to attend an Acorn Farmer’s Symposium. We managed to go through the paperwork and have a walk around the Gardens and finish by 10am. Gerlinde remains in Europe so Stephan has taken on the Garden alone and for the first time from the beginning of the growing season. He has had a very successful season to date. It has been a year of re-thinking the direction of the farm, as well as maintaining what has been built up over the years. On a personal note, Stephan has become engaged again in his Photography during the winter months, already publishing a book as well as exhibiting them.